Your Students will Love Yabla. Don’t take our word for it! See what the students at The Connecticut International Baccalaureate Academy (CIBA), a 5-year subscriber, have to say about Yabla. Yabla uses authentic content and a unique video player to improve students' listening comprehension, vocabulary, and spelling. Every student has their own login, and teachers can assign activities, set goals, and monitor student performance. Videos from the world's best commercial, public, and independent broadcasters. Yabla brings your students compelling authentic programming. Yabla partners with the world's best commercial, public, and independent broadcasters. 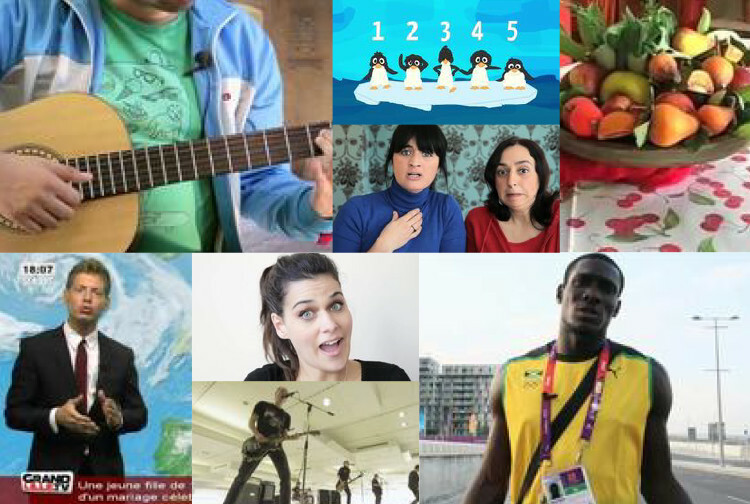 Music videos coming from the likes of Sony Latino, Sony France, Universal Latino and Universal Europe drive student interest in the living language through contemporary, meaningful culture. Documentaries and news from passionate independent producers and networks such as Tv Peru, Gallovision and France2 draw students into the greater world of science, technology, ecology, economy, and history. Exclusive interviews and travel videos will bring them into contact with musicians, chefs, scientists, students, doctors, and other real people representing a great variety of accents, regions, and social classes. Easily add students and colleagues at any time. Give your students access to Yabla, quickly and easily. With a school account, your students can quickly and easily sign themselves up, choosing their own username and password, at their (or your) convenience. You can also directly add and/or delete users at any time, using your allocated slots as needed. For example, you are welcome to give access to one set of students one semester and switch to another set of students the following semester. Students will be able to log in and access Yabla video language immersion at any time from any location. Assign videos to your students as homework or lab assignments. Assign activities to your classes. You can assign videos based activities to your students as homework or lab assignments. Students complete assignments by playing the games and earning points. As students complete the assignments, you can monitor their progress in a gradebook and a detailed activity report. This helps to ensure that students are actively engaged in the videos. Watch a video and use the "games" button to try the available activities. Beginner or advanced, middle school or Ivy League, learners at all levels benefit from actively listening to native speakers. Current subscribers include top academic institutions such as the University of Michigan and Brown University, as well as public and preparatory schools at the secondary and middle-school levels. Need Yabla for a School District? Get Yabla for your classroom today! Daniela teaches us the Italian way to say hello and goodbye, to both our friends and to people we don't know. Adriano is not only charming, he was able to teach his new Polish girlfriend how to speak Italian in just a few months, with a little help from Yabla. Marika and Anna conjugate the verb to be in the simple present, present perfect, and simple past. Stai lontana da me (Stay away from me) is a 2013 Italian romantic comedy starring Enrico Brignano and Ambra Angiolini. The laughs start quite early on! Today Marika talks to us about the head and the face. You can learn or practice by repeating after her. Arianna just got her Marketing degree and is looking for a job. Let's see how she goes about it.